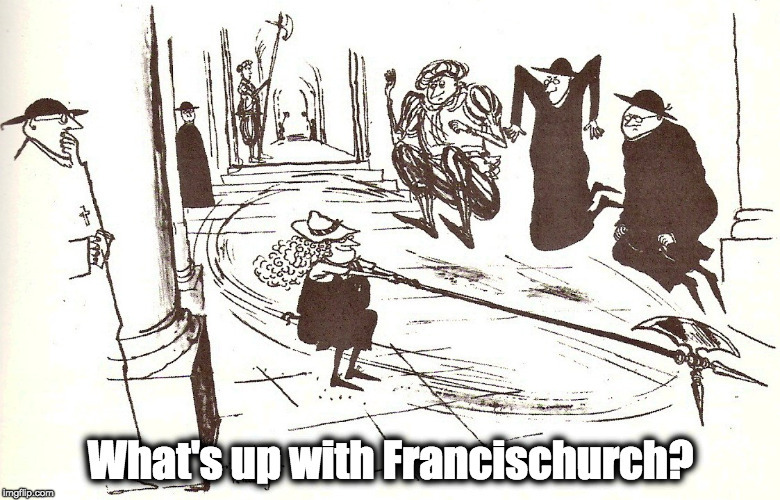 Francis subsumes Ecclesia Dei into CDF – What's Up With Francis-Church? One conclusion is evident: as the so-called Ecclesia Dei communities have preserved “their spiritual and liturgical traditions”, they clearly do not count in this discussion. If they remain attached to a section of the Congregation for the Doctrine of the Faith, it is incidental. They can have the Mass, the “spiritual and liturgical traditions”, but not the whole doctrine that goes along with them. 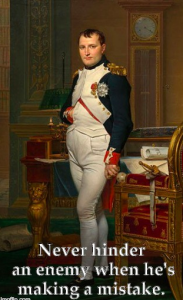 That has always been the Society of St. Pius X’s great reproach against Dom Gérard [founder of the Benedictine monastery at Le Barroux who worked with Archbishop Lefebvre until 1988] and all those who thought they should break the unity of Tradition in order to negotiate a purely practical agreement. The crisis of the Church cannot be reduced to a spiritual or liturgical question alone. It is deeper, for it touches the very heart of the Faith and the doctrine of Revelation, Christ the King’s right to reign here below over men and over societies. If you don’t know what he’s talking about in the last line, that’s the one thing that separates you from the “traditional” Catholic Faith. The Social Reign of Christ the King. It’s the place no one wants you to go. So, maybe we should go there, a hint as to the direction our explorations here need to take. I’ve got some books we should take a look at together. If they were to ask, this is pretty much the advice I’d offer. UPDATE: As we say in the journalism biz, it’s a “developing story”. In the Letter, Pope Francis notes the “sincere solicitude and praiseworthy care” with which the Commission undertook its work. He explained, however, that “the conditions that led the holy Pontiff John Paul II to the institution” of the Ecclesia DeiCommission have changed since its foundation. Notably, the dialogue with the FSSPX is now focused primarily on questions of a doctrinal nature. For this reason, the Congregation for the Doctrine of the Faith requested, in November of 2017, that the dialogue with the priestly fraternity be conducted directly by the CDF. What neither Chris mentions, of course, (and neither does the letter) is that the work of “dialogue” with the SSPX isn’t the only thing Ecclesia Dei was doing. No mention at all is made by anyone about what the plans are for all the existing religious communities – many of which were founded after Ecclesia Dei was established – that are supervised under their auspices instead of the Congregation for Religious, a body that manifestly loathes the traditional rites. It is certainly not going to be the appropriate task of the CDF to supervise these religious orders and fraternities of priests who exist in order to maintain the traditional liturgy (and religion). I’ll be keeping a close eye on this, since I know that a lot of religious, particularly women’s orders and communities, are watching with great concern the progress of Cor orans – the decree of the Congregation for Religious ordering all contemplatives to get in line and get with the New Paradigm programme. If I were the superior of, say, a house of Benedictine nuns dedicated to the traditional rites, with20 or 30 or 40 nuns and novices, and millions worth of real estate assets, I’d be a fool to take this little one-line addendum as any kind of promise that the torpedoes of the Congregation for Religious weren’t being re-calibrated right now. From the letter from Francid we get this about the orders: A mention that they exist that doesn’t answer any questions, but that given what we know is happening elsewhere <cough>FFIs</cough> could easily be taken as a veiled threat. And… so? What about it? Does “found their own stability of number” mean “that’s all you’re going to get, so anyone wanting to switch can fuggedaboutit”? Well? What does that mean? He’s the same guy who made this little speech last year about how Italy, being a “dying nation,” desperately needs the hundreds of thousands of young African Islamic men who have come flooding into the country in the last several years, particularly since the election of the current pope. “In an Italy afflicted by a devastating demographic winter, the presence of young migrants represents a timid hope for the future.” The auxiliary bishop of Perugia, Paolo Giulietti, speaks thus in view of the 103rd World Day of Migrants and Refugees, scheduled for Sunday, January 15, a few days after the signing of the “Memorandum of Understanding” between the State, the Church and the Community of Sant’Egidio for the opening of new “humanitarian corridors” that will allow the arrival in Italy in the coming months of 500 Eritrean, Somali and South-Sudanese refugees, who have fled their countries due to ongoing conflicts. Made Aux-Perugia in 2016, the sudden rocket to Ab. of Lucca implies strongly that he’s one of the men-of-the-moment, sent forth to spread the Bad News of the Bergoglian Faith far into the future. He’s been the man-of-migrants in Perugia since his appointment. Dispatched by Cardinal Bassetti – Francis’ personal choice for both Ab. of Perugia and the president of the Italian Bishops’ Conference (CEI) – to the small commuter town of Ponte San Giovanni (about 9 km from where I live, btw,) where there has been constant migrant-related violence. PSG is overwhelmed with Islamic African and Middle Eastern migrants, most of whom seem to have nothing in the world to do but loaf around the train station all day and night scoping out victims. The Carabinieri of Ponte San Giovanni are looking for the aggressors in the context of the “migrants” who frequent the neighborhood. Not an easy hunt. Unfortunately there are no cameras in the station, so the search of the managers starts with the testimonies of the railwayman and the colleague who was in the cage. According to the reconstruction of Ferrovie dello Stato, the man, busy on track 1 to receive an arriving train, had noticed the unjustified aggression that a boy was suffering from a group of 3 foreigners, it seems from Maghreb. The stationmaster intervened to try to defend the boy and was hit in the face by a glass bottle taken from the trash bin and intentionally broken. A few moments later he was hit by a chest stab, attacked by one of the three attackers, chased to his office, where he had taken refuge. He was finally made the object of throwing rocks and metal objects (taken from the roadbed and tracks ) from the pack of immigrants, who also managed to break through the glass door of the office.The warning that he had already called 112 deterred the attackers from continuing the violence and forced them to flee. On the spot, the Carabinieri of Perugia, the railway police and an ambulance of 118, who transported the stationmaster to the thoracic surgery department of the Santa Maria della Misericordia Hospital in Perugia, where he was found to have facial cuts and a wound from chest cutting weapon. They started, finally, rebuilding this station, so there will be an underpass (at the moment, you have to wait until the bell is ringing to tell you the train is coming, and then walk across the tracks to get to the correct platform ahead of the train. If you wait until the train is in the station and loading, you will miss it because it blocks the walkway) and generally better facilities. 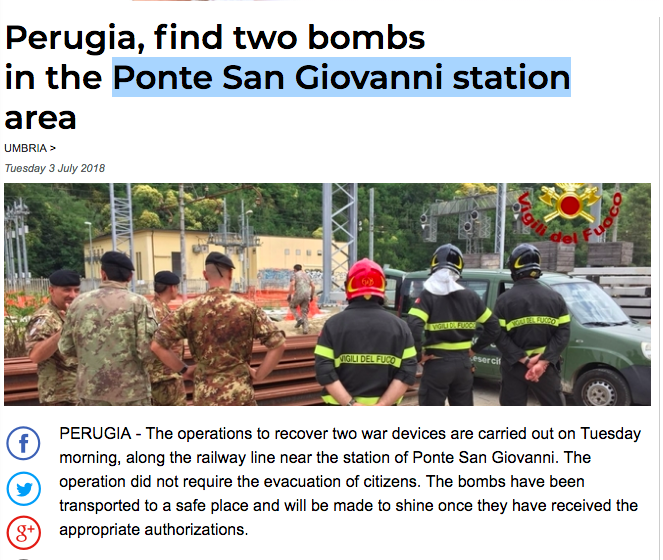 Given that this is the first stop for Perugia – the regional capital – from the main station at Fontevegge on the tourist line from Rome, the run-down, crime infested and dangerous conditions at this station constitute a national disgrace. So they’ve started building. I’ve been there a few times since they started the works and it does look a lot better. And now there are (usually) military police there in fatigues, carrying automatic weapons, presumably to protect the construction workers from violence. Apparently the local jihadis regard this as an incursion into their rightful hunting ground. 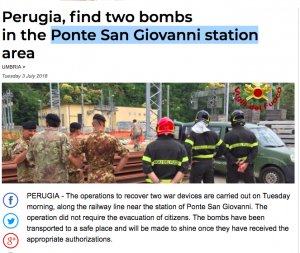 PERUGIA – The operations to recover two war devices are carried out on Tuesday morning, along the railway line near the station of Ponte San Giovanni. The operation did not require the evacuation of citizens. The bombs have been transported to a safe place and will be ignited once they have received the appropriate authorizations. On site the firemen of the headquarters of Madonna Alta, for the necessary support to the army blasters, and the police. The army vehicle that physically carried the two bombs was escorted by police and firefighters. Ponte San Giovanni is a nasty dive, and it has become extremely dangerous since the migrant invasion. I was at this train station on Wednesday evening, waiting for about five minutes for my ride. There was a constant parade of African young men – in their late teens and early 20s, I would guess – through the station’s waiting area. I don’t know where these guys are always going, but you see them on the trains – often in large groups – constantly. I was told by “Dennis,” a young Christian Nigerian guy in one of my Italian classes a couple of years ago (here to study engineering) that everyone in Africa knows that the hundreds of thousands of young single men pouring across the Mediterranean into Europe are actually the criminal underclass being expelled from countries who didn’t want to deal with them anymore. They’re criminals, into drug dealing, prostitution and gang violence, and from countries where violent lawlessness is the only rule of life. They’ve come here looking for more lucrative and easygoing business opportunities. Perhaps some enterprising Italian journalist will think to ask the good Archbishop-elect why, precisely, Italy has been visited by this “devastating demographic winter” and what he intends to do about it.